I recently accompanied some friends over on holiday to the Paseo Maritimo in Playa de las Américas in search of a good restaurant to stop and enjoy a nice seafront meal. 27.04.2015 - Fortunately, we managed to agree on probably the best of the choices along the walkway, and instantly felt at home in the wonderful Café de Paris. Open 365 days of the year, with an impressive 20 year history, it’s easy to see why the popularity of this establishment has never waned. Possessing a beautiful open terrace directly beside a popular surfer’s beach, we were greeted by the friendly waiter and shown to our table at the end of the terrace, just 20 metres from the rolling waves of the Atlantic Ocean, with views of the coastline of Costa Adeje. My holidaymaking friends were mightily impressed with the scenery, colourfully illuminated by the sunset, and cocktails were ordered to take advantage of the setting. Inside the restaurant, a live band supplied wonderful entertainment and a fine selection of golden oldies that had us tapping our feet. As darkness slowly descended, the last remnants of spring warmth dissipated and we decided to move inside to avoid the chilly night air spoiling our dining experience. At the display tank, we all chose our fresh fish and ‘catch of the day’, expertly advised by a member of the kitchen staff, and took our seats at the table. I opted for sole, my friend’s wife selected fresh tuna fillet while he chose a juicy T-bone steak. The other lady in our group, a vegetarian, ordered a dish of fresh vegetables from the menu, which is available in English, Spanish, German and most other European languages. It had so much on offer that we really had to consider carefully what we all wanted. When it came to ordering, our limited Spanish wasn’t a problem as the waiter understood English and German perfectly and all language problems were avoided. We had chosen Serrano ham, various tapas – including vegetarian options – as well as garlic bread as starters; all of which were absolutely delicious. After a perfectly timed interval, our main courses arrived; a big plus was that all the plates were preheated, while the steak arrived on a sizzling hotplate served with herb butter. In addition there were potato wedges and sautéed mushrooms. My well-prepared sole came with lemon butter sauce and delightful Canarian potatoes, while a large bowl of mixed salad was set down for us all to take advantage of. The tuna fillet came with its own special Café de Paris sauce and, as requested, in place of Canarian potatoes, French fries along with its own small side salad. In the vegetarian dish was a range of different fruits and vegetables, saffron rice, hollandaise sauce and a small bowl of ali-oli. The waiter told us that the organic vegetables were freshly grown on the family’s local ‘finca’ and the wonderful taste and tenderness only confirmed this. As the portions were quite large we found ourselves with the desire for dessert, though not much space, but we ordered the Pancake Flambé, nevertheless, which was like a big brother to a Crêpe Suzette. When the bill arrived we found the price to be very reasonable, especially considering the beachfront location, fresh quality of the food, and friendly waiting staff. Service – The waiters were very attentive without harassing or interrupting our meal with suggestions, as can happen elsewhere, and their language skills were impressive. Nine out of ten. Decor – The restaurant was well presented with a nice Parisian flair, as you’d expect from the name. Seven out of ten. Lighting – Subtle lighting gave the restaurant a nice ambience, and every table had a small lamp, which worked well with the live music on offer. Eight out of ten. Drinks – They had an ample choice of Spanish and international wines, a full cocktail list, and most spirits and beers are also available. Eight out of ten. Food – The portions were very large, bordering on ‘overloaded’ but tasty, well-prepared, and because of the ecological cultivation of fruits and vegetables I decided to give a special bonus here. 8.5 out of ten. Cleanliness - Hygiene is very important, and although the toilets have not been redecorated recently, they are kept very clean. An hourly check guarantees this. Eight out of ten. Restaurant and activities – You have two choices inside the restaurant; you can enjoy your meal in a quiet area, or be placed in the ‘middle of the action’, directly in front of the entertainment on offer. So if you like getting up to dance to the live band (three different groups every day), be amazed by the flamenco show, or be charmed by the parrot show or any of the attractions they hold every week, this would be the best option for you! 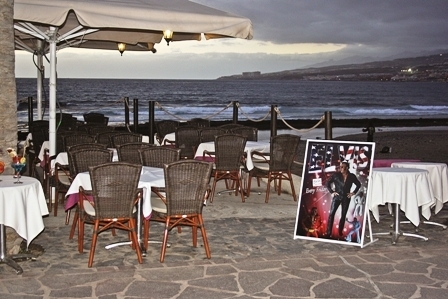 You will find Café de Paris at CC Carlota, Paseo Maritimo, in Playa de las Américas. It’s well worth a visit!